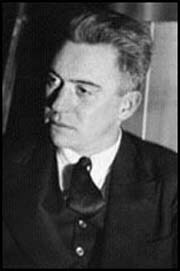 We were touring through Greenwich Village, showcasing places of literary significance, when we remembered that today marks the 80th anniversary of the death of poet Hart Crane. Best known for his long-form poem The Bridge--a celebration of America using as its central symbol the Brooklyn Bridge--Crane was one of the greatest modernist poets of his generation. Plagued by alcohol problems and the perils of being a gay man in a closeted society, Crane cut short his own life on April 27, 1932, when he jumped from a steamship in the Gulf of Mexico. Crane lived a number of places in New York, including 45 Grove Street, 54 West 10th Street, and 79 Charles Street in the Village, and 110 Columbia Heights in Brooklyn Heights, where he wrote the bulk of The Bridge. Only later did he discover that the bridge's co-designer and chief engineer, Washington Roebling, had once lived in the same apartment building overlooking the East River. James Franco's film, The Broken Tower, which is a biography of Crane, opened in limited release today. 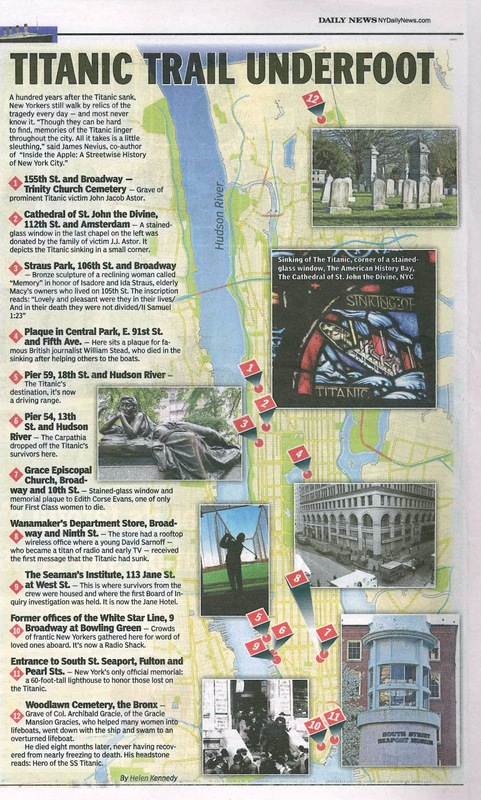 Interested in a literary walk of Greenwich Village? We lead private tours for groups large and small; contact us at walknyc@gmail.com or events@insidetheapple.net for more information. We hope everyone has a great weekend, and we just wanted to remind you that tickets are still available for Sunday's 3pm performance of The House of Mirth at the Metropolitan Playhouse. After the show, we'll be talking about Edith Wharton's New York and how the mores and customs of the times are reflected in the play and her other writings. It should be a lot of fun and we hope to see you there! This version of the novel was written by Wharton herself and is seldom revived, so if you are a Wharton fan you won't want to pass up this opportunity. The play opens tonight and runs through May 20. Tickets are available at http://metropolitanplayhouse.org/houseofmirth. There's been much fanfare in commemoration of the sinking of RMS Titanic on April 15, 1912, en route to New York on its maiden voyage--a new miniseries, the re-release of James Cameron's 1997 film Titanic in 3D, and a host of articles, documentaries, and museum exhibitions. We recommend the exhibition at the South Street Seaport Museum entitled Titanic at 100: Myth and Memory, which is running through May 16. The exhibition features a host of Titanic ephemera, from the china commissioned for the ship (the examples on view were extras not taken on that first voyage) to advertisements in New York for the April 20 return voyage to Europe that never happened. The most fascinating part of show is its centerpiece--the dispatches sent and received from the Titanic, Olympic, Carpathia, and other ships by marconi wireless operators that document the sinking in real-time. More information about New York at the end of the Gilded Age can be found in our book, Inside the Apple: A Streetwise History of New York City, available from Amazon.com and fine booksellers everywhere. We saw a preview performance last night of Edith Wharton's adaptation of her best-selling novel House of Mirth at the Metropolitan Playhouse and we urge you to go. Wharton was the most adept chronicler of New York's social set in the late 19th and early 20th centuries, and she and playwright Clyde Fitch did a masterful job of taking the varied settings and situations of the novel and figuring out how to make them work on stage. As always, the cast and direction at the Metropolitan Playhouse are top notch, especially Amanda Jones as Lily Bart. Of course, we'd love it if the performance you came to see is this Sunday, April 29, at 3:00pm. 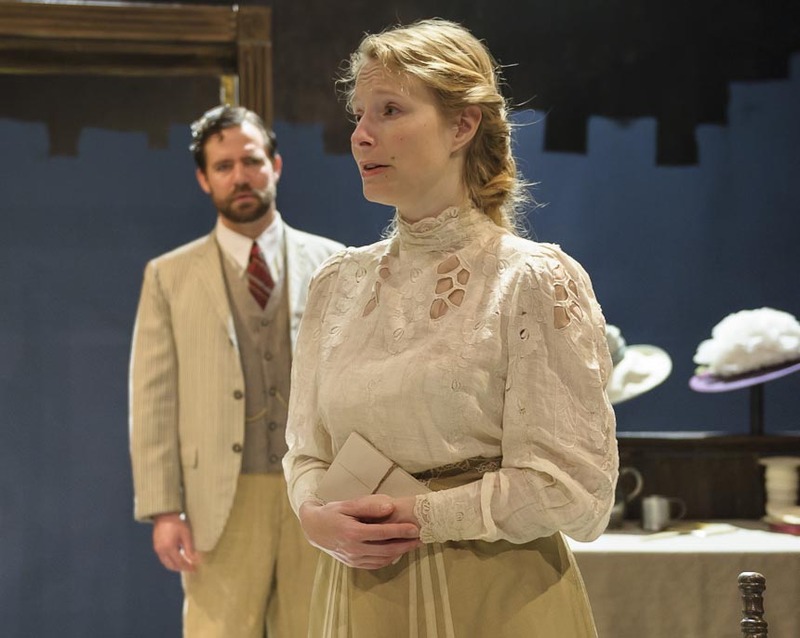 Following that matinee, we'll be joining director Alex Roe for a talk back with the audience where we'll be discussing the world of the play and the New York in which Edith Wharton lived and worked. You can buy tickets for that performance at this link: http://metropolitanplayhouse.org/HOM8. The show officially opens on Friday and runs through May 20. On Sunday, April 29, we will be appearing at the Metropolitan Playhouse in the East Village to do a post-show talk-back following the 3:00pm performance of Edith Wharton's House of Mirth. After the Metropolitan's performance, we will be talking about Edith Wharton's New York and the role it played in shaping her writing; her New York works include classics such as House of Mirth and The Age of Innocence, as well as lesser-known titles such as The Custom of the Country and Old New York. We'll being copies of our own book, Inside the Apple, for sale and signing. 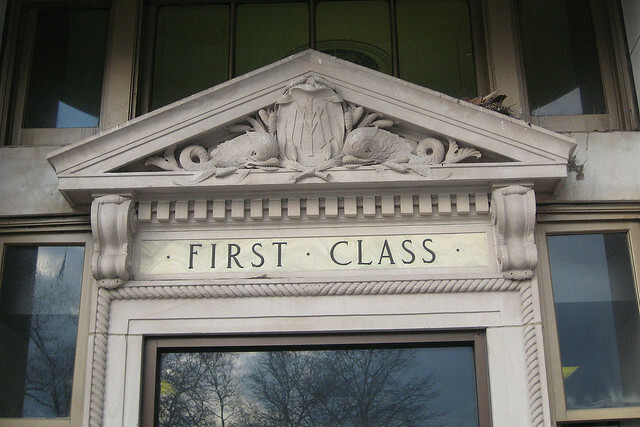 REMINDER: Today's the last day to reserve at the $10 discount for our 4/22 tour of Gilded Age Lower Manhattan. 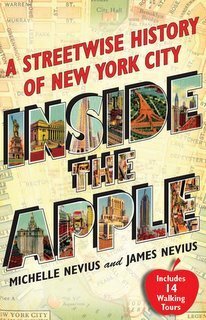 Join James Nevius, co-author of Inside the Apple: A Streetwise History of New York City, on Sunday, April 22, to explore Beaux Arts architecture in Lower Manhattan. This is the era of JP Morgan, and we’ll see a number of sites associated with him, including the House of Morgan and International Mercantile Marine (IMM) ticket office. 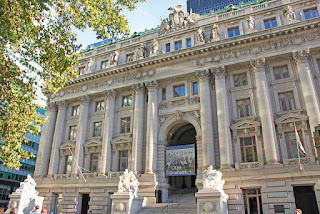 IMM owned, among other ships, White Star’s Titanic; since the centennial of that boat’s sinking is just one week earlier, we’ll also talk about the golden age of New York as a port for both goods (as evidenced in Cass Gilbert’s triumphant US Custom House) and people. The tour will last between 1.5 and 2 hours. Copies of Inside the Apple will be available for purchase at the tour. · A good email address where we can send you information about where the tour will start. PLEASE NOTE that if you reserve no later than Sunday, April 15, the cost is just $10 per person. All reservations received starting Monday, April 16, will be $15 per person. This tour will have only a limited number of spaces, so please reserve early to avoid disappointment. Payment will be taken at the start of the tour by cash only. Directions to the tour’s starting point will be sent out after your reservation is confirmed.